We're packing our bags in preparation for Nokia's event on Thursday, but we may have little surprises left by the time we arrive in New York City. 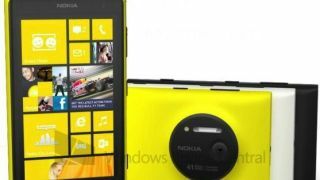 Bits and pieces of the handset that Windows Phone Vice President Joe Belfiore tittered on Flickr as the Lumia 1020 have been leaking out for some time now, and this afternoon we have even more to hang our hat on. In a render of unknown origin picked up by WP Central, we see what's purported to be the phone alternately known as Elvis, EOS and Nokia 909 in yellow, white and black. The phone's ginormous camera sensor is front and center, stamped with "41 megapixels." WP Central claimed the snapper comes with both a Xenon and LED flash, plus packs optical image stabilization (OIS). The addition of the latter, which was missing from the PureView 808 yet introduced in the Lumia 920, is designed help produce sharper images in low light. To round out the camera kernels, the handset is said to take images in both 32MP and 5MP with an aspect ratio of 16x9. The 5MP snap is "over sampled," with seven pixels dropping into a single "super pixel." If super pixel makes you think UltraPixels, we're right there with you. The 1020 can also supposedly take an image at 38MP with a ratio of 4:3. As for the rest of the specs, we're possibly looking at 2GB of RAM, 32GB internal storage with no SD card and NFC. Two gigabytes of RAM would be a leap above most Windows Phone 8 handsets, by the way, and should leave ample room for high-res pics. OK, now back to the mainstay of the device. In addition to OIS, the 1020 also reportedly houses an F2.2 aperture. The Pro Camera app we've heard about before should feature settings for ISO, white balance, manual focus, shutter speed and flash. Russian site Izvestia spotted what looks to be a camera grip to outfit the new Lumia with, though the accessory is expected to cost an additional $70 (about UK£46, AU$76). For the price, users not only get a way to hold their Lumia with one hand, it's supposedly equipped with a 1,020 mAh battery for on-the-go charging plus microUSB for extra juicing. There's also a slot to insert a tripod mount and a shutter button. If the 1020 sounds like a phone you want to slip into your pocket (though "slipping" may be more like jamming with that camera sensor), shipments could land in Microsoft Stores as early as July 22, with shipping dates posted later that week. WP Central noted U.S. carrier AT&T is expected to sell the Lumia by the end of the month. Off-contract pricing sits at $602 (about UK£402, AU$658), the website said.